A stranded whale was transported Monday night from Molokai to Oahu by the Coast Guard for a necropsy. Hawaii Pacific University researchers will perform the necropsy outside because the animal is too large for the facility. Hawaii Pacific University researchers are performing a necropsy on a Cuvier's beaked whale, after the mammal was found stranded on the Molokai shoreline Monday and then euthanized. To report a marine mammal stranding, call (888) 256-9840. "The veterinarian at about 4:30 (p.m.) determined that the most humane course of action for this animal was to euthanize the animal. That's a decision that we all take very seriously," said Chris Yates, National Oceanic Atmospheric Administration's assistant regional administrator for protected resources. NOAA received a call on its hot line about 8:30 a.m. Monday reporting a distressed whale on a beach five miles east of Kaunakakai. Earlier in the day, concerned people pushed the whale back into the ocean, but the marine mammal tried to strand itself several times after that. "People are very well-intentioned, and we can't criticize anyone for trying to help this animal," said Yates, but he added, "what we want to say is that people should stay away from stranded animals." "A 2,500-pound animal can cause a lot of damage to somebody." 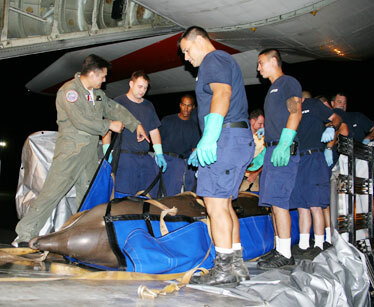 The last Cuvier's beaked whale stranding in Hawaii was reported on July 2007 near Wailua, Kauai. Monday's incident is the eighth whale or dolphin stranding in 2008, according to the spokeswoman. News of the whale's death has prompted environmentalists to draw a possible correlation between the Rim of the Pacific naval war games and the stranding. "Obviously I feel that there may be a correlation because, for one thing, this type of whale stranding does occur for a variety reasons. This particular type of whale has consistently been associated with stranding related to the Navy's sonar all around the world," said Paul Achitoff, attorney with the Earthjustice office in Hawaii, adding, "So when one happens while the Navy is using its sonar ... it's obviously something that should raise concern among any objective person." A spokesman for the U.S. Pacific Fleet said the training portion of RIMPAC involving 35 ships and 10 nations ended Monday. "Any statements implicating sonar or RIMPAC activities are premature and speculative," said spokesman Mark Matsunaga. "There is no indication that naval activities caused or contributed to the stranding," he said. Coast Guard officials transported the whale on a C-130 plane to Oahu Monday night for the necropsy. "Sometimes the best thing that you can do is rule things out. There are so many things that could happen to the animal that we can't necessarily point to one thing," said Brenda Jensen, Hawaii Pacific University associate dean of the college of natural sciences. Under a partnership with NOAA, HPU has an agreement to respond to strandings and perform marine mammal necropsies.